Janko Tipsarevic, a Serbian tennis player, is rightly considered to be one of the brightest tennis stars today. In 2001 Janko achieved his first great success, having won Australian Junior Open Championship. However, in contrast to many promising young sportsmen who have never shined in the sky of adult tennis, Tipsarevi? has become one of the strongest senior tennis players. More than 10 years passed since the moment of his first success, and only then did Janko Tipsarevi? enter Top 10 single, having lifted from 183 to 8 position in the world ranking. Moreover, he has defeated such wonderful tennis players of all times as Novak Djokovic, Andy Murray, Carlos Moya, Andy Roddick, Marat Safin, Lleyton Hewitt etc. In spite of the fact that Tipsarevi? spends most of his time on tennis working out and participating in the international championships, he continues to master his skills not only in sports, but also in all other spheres of life. The manysidedness of Janko's personality amazes: his interests touch on literature, music, German and Russian philosophy. On court one can really see that Janko is a unique sportsman: ability to take control over emotions, to concentrate on the result, to demonstrate a persistent will to victory set by set, never stopping at losses. All this shows Janko as a brilliant, young and talented tennis player who does not lose individuality even at challenging difficulties. 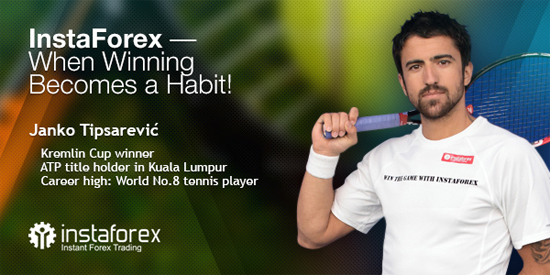 InstaForex is glad to co-operate with the representative of the world tennis elite Top 10, in fact, a tennis player Janko Tipsarevi? and a broker InstaForex have much in common: the highest grade of effectiveness of the work performed, a striving to become No.1 in the world, as well as numerous reputable awards. Top career result - world No.8 singles, current ranking is world No.9.